Steeped in history and with some surprising stories to tell, learn more about the village of Barley. Barley is a village and civil parish in the district of North Hertfordshire, England. According to the 2011 Census, it has a population of 662.The place-name refers to a lea or meadow and not to the grain-producing plant. The Prime Meridian passes to the west of Barley, which is located on the Royston to Saffron Walden road, as well as the medieval London to Cambridge road. The village of Barley lies at the north eastern tip of Hertfordshire, tucked away in a hollow on top of a hill. Listed in the Doomsday Book as Berlei, this was the Norman version of an older name; pre-conquest it may have been known as Beora’s Ley, meaning ‘a woodland clearing owned by a Saxon Lord called Beora’, or Beora sele, which in Old English simply means Beer or Feasting Hall. Although the village is concentrated around a central meadow, or Plaistow, the parish of Barley is actually far larger. It includes the hamlets at Smith’s End, Shaftenhoe End, Abbotsbury and Mincinbury, extending from the A505 close to Royston in the north all the way to Morrice Green in the south. The parish boundaries are ancient; to the north and east the borders once separated the Anglo-Saxon kingdoms of Mercia and East Anglia. 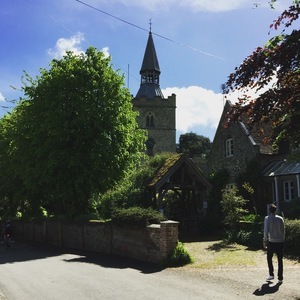 The village also lies close to two of the four great highways of medieval England; Ermine Street, a major Roman road and the Icknield Way, the ancient track that links with the Peddars Way and The Ridgeway to create a trail from Norfolk to Wiltshire. 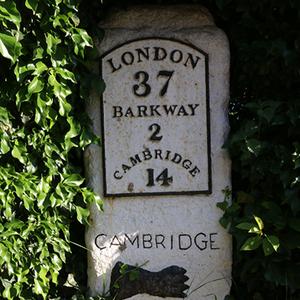 The main road through the village was also the medieval route from London to Cambridge. The land to the north of the village is chalk and gravel; to the south this turns to boulder clay and was once heavily forested. The Barley hills are part of the chalk escarpment known as the East Anglian Heights. They also mark a watershed; to the south and east watercourses form part of the Thames basin area, whilst the streams running northwards off the hills are tributaries of the Great Ouse that flows into the sea at the Wash. There is evidence of Neolithic and Bronze Age activity in the parish and settlement from the Iron Age. Groups of Romano-Britons also lived in the area and the Normans viewed Barley as one of the major villages of Hertfordshire. In the late Middle Ages much of the land was owned by religious orders, so there were no resident lords of the manor. After the Dissolution, the pattern of absentee landlords continued; eventually, consolidation by successful tenant farmers and by enclosure resulted in a few large farms. The parish church of St. Margaret of Antioch was built in the 12th century. Otherwise, traditional buildings in the parish mainly date back to the 17th century; however the Town House with its original timber roof is early Tudor and is one of the oldest village halls in the country, having also been used variously as a school, workhouse and almshouse. 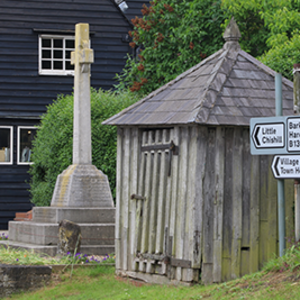 The timber-framed Barley Lock Up by the war memorial is 17th century. Always an agricultural community, Barley has also been home to men and women who were great scientists, soldiers, politicians, actors, artists and religious leaders. The first mayor of New York once lived in Barley and two Rectors went on to become Archbishop of Canterbury. Agricultural and medical advances in the 19th century supported larger rural families, so that the population rose to nearly 900 at its peak in the mid 1800s, living in 179 dwellings; but by 1901 the number of residents had fallen to 505, due to agricultural depressions, farm mechanisation and general population drift to towns. Over a century later, the 2011 census shows a population of 662 living in 287 dwellings.